The seesaw obstacle can be the most unnerving of all the obstacles for a dog running agility, especially dogs that are just learning. This is the only obstacle that not only moves when the dog is on it, but also makes a noise when it hits the ground and bounces back up at him. With patience and a bit of time, the seesaw can become a fun obstacle for the dog once he learns to control it. 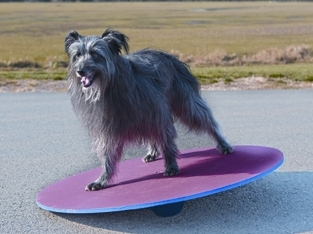 A helpful tool that noted agility competitor Diane Bauman uses before introducing the dog to the actual seesaw is a wobble board, also called a Buja board. This is simply a board that is big enough for the dog to stand on with a ball attached underneath. The ball prevents the board from lying flat, so when the dog walks on it, the board wobbles. These boards are available from agility equipment companies or you can make one yourself. 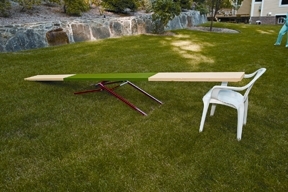 If you have a low table, you can place a bar under one leg so that it is uneven. When the dog walks on it, it will wobble. Make sure that it is low to the ground so if the dog jumps off, he won’t have far to go. You can also go to the playground where they have swaying bridges to teach him about things moving under him when he walks. Again, make sure that if he falls or jumps off, he won’t have far to go. Before you begin to train the seesaw, teach your dog to walk comfortably on a board or plank on the ground. He should be comfortable walking and lying down on it. He should also have a solid lie down. The best way to teach the seesaw is to show the dog that he has control of the board. Using an adjustable seesaw and a chair with arms on the one end, start out with teaching him to pull the seesaw down while standing beside it. This can be done by placing a treat close to the pivot point and encouraging the dog to place his feet on the seesaw to pull it down and reach the treat. Continue to move it higher up so he must work harder to reach the treat. Ideally, the goal is to have the dog pull down the board and stand on it. While you are teaching him this, maintain control of the board so it does not scare him by dropping too fast or bouncing back and hitting him. To train the dog to take his first steps across the board, encourage the dog to walk up the board by gently guiding him by your hand in his collar (do not pull! ), placing treats on the board (think Hansel and Gretel) or luring him with food in your hand. Once he has reached the end of the board, give the command to lie down or stand. Reward him then release him. You can either pick him up or he can jump off by himself. This teaches him that he can get off of the obstacle, and he will feel less trapped when on it. At first, the dog may jump off the board before reaching the end. That’s ok. He’s learning that he can. Start him over again. While he may continue to jump off, he will reach a point where he gets curious as to what will happen if he goes to the end. Reward him when he reaches the end with a bit of a jackpot. If he’s jumping off at the end of the board, stand in front of him, as this gives him something to focus on ahead and will help him feel more balanced. For the dog that is afraid to get on the board at all, go back to a board that is flat on the ground and with your hand closest to him in his buckle collar, prevent him from going right, left or backward. With your other hand, lure him with a food reward or a toy to walk down the board. Be patient. Don’t talk to him or pull him. Let him decide to go forward on his own. Soon he will figure out he has nothing to fear, so will begin to walk forward. With time, patience and encouragement, your dog will soon be happy to walk across the seesaw and you can start teaching him different approaches and movement. Until then, continue to practice with the seesaw falling into the chair, but raise the seesaw four to six inches slowly, pausing if he starts to feel uncomfortable, until the dog is comfortable at full height. This entry was posted in agility and tagged agility, agility training, Diane Bauman, introducing the seesaw, seesaw in agility, teaching the seesaw, training a dog on the seesaw. Bookmark the permalink.